Michael Dorn meets with advocates for the children when presenting for the Clinton County, Kentucky School District. I had the opportunity to meet some outstanding advocates for the children when I presented for the Clinton County, Kentucky School District. These amazing people were able to teach a number of new school safety tricks to an old dog. 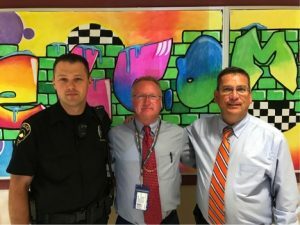 With the school year about to start, Albany Elementary School Principal Tim Armstrong and Officer Rick Marcum took time during a busy time of year to show me an array of outstanding safety, security and emergency preparedness measures that have been implemented. I had the great privilege of presenting for the Clinton County, Kentucky School System just before the school year started. I am so glad that I had the opportunity to present at the district’s back to school event. The district has implemented a wide array of excellent practices relating to school safety, security, emergency preparedness, climate, and culture. The enthusiasm of the staff, excellent working relationships between support staff and educators and the competence of the building and district leadership personnel made working with them a true joy. I arrived early so I could do a brief parent presentation at Albany Elementary School. After the presentation, I spent a couple of hours touring the school with Principal Tim Armstrong and the dedicated Custodial Supervisor Michael Hood. As with every building tour I have participated in, I was able to point out some options for consideration to enhance safety, security and emergency preparedness. However, I found far more things being done extremely well than I did things that could be done better. Without question, the school’s approach to a safe, orderly and efficient flow of traffic in the mornings and in the afternoons is remarkable. Mr. Armstrong has worked with a software programmer who has extensive experience developing identification systems to develop a QR code reading system that allows school staff to rapidly scan parent identification tags as they enter the parking lot. This pulls up the parent’s photo and shows that they are on the authorized list to pick up their child. At the same time, the system cues staff in the school’s gym to bring the child to the door so they can get into their vehicle. The system combined with a loop driveway and awnings has taken a situation that used to be slow, disorganized and unsafe, and turned it into a system that is far above leading practice. As data shows that student arrival and afternoon dismissal offer the most potential for death of students and staff of any school activity, this effort is among the most practical and effective efforts to reduce the dangers associated with vehicles strikes, abduction of students by noncustodial persons and vulnerability for mass casualty acts of violence during these vulnerable times. The next morning’s activities were absolutely awesome and I had a blast delivering my thirty-minute message set in between two extremely thoughtful and impactful audio-visual presentations (www.clinton.kyschools.us). The final audio-visual segment was an extremely well-done video depicting school district personnel as superheroes. These presentations, opening remarks by the superintendent and key staff combined with my keynote were designed to help drive home an effective and important message to all categories of employee that they all have the opportunity to be super heroes for the students they all serve. At the end of the 90-minute session, staff appeared to be fully energized and pumped up to start the new school year on the following Monday. I also had the distinct honor to meet an amazing school resource officer. Officer Rick Marcum is a dedicated veteran law enforcement and highly educated officer who has worked closely with the district to help them develop a number of the impressive practices I saw during my visit. Officer Marcum is working on his doctoral degree in education. Though I have never pursued a doctorate, I know how hard it is to attend college and work as a law enforcement officer. From the interaction between staff, students and parents the afternoon before my presentation it is clear that the dedicated and highly-motivated men and women who make up the Clinton County School System achieve superhero status for school children on a daily basis. I feel so blessed to have been afforded the opportunity to meet and interact with the remarkable people who have built what I wish every school system could be – a place where superheroes help protect, nurture, educate and inspire those who hold the keys to our future.